"The most rewarding business I've ever been a part of!" AND IT CAN BE FOR YOU, TOO! 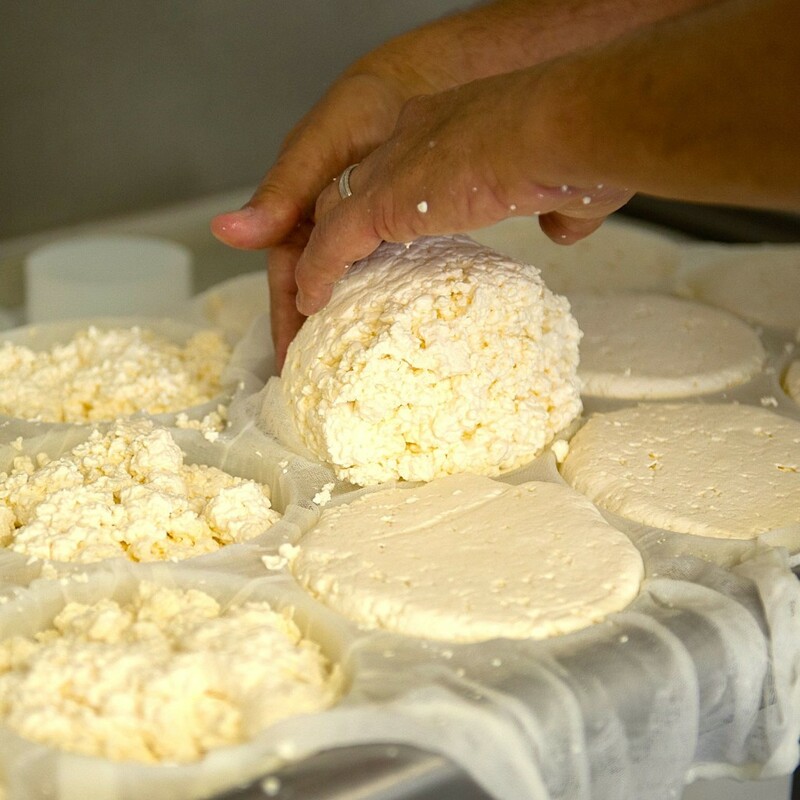 You're a cheese lover or amateur cheese maker and you're curious about becoming an artisan cheese maker. Or perhaps you’re entrepreneurial and are curious about the explosive growth in artisan cheese. You may already own a food business...a restaurant, winery or resort and you’re interested in adding artisan cheese. Or maybe you already have a farmstead and you’re curious about adding value to the great milk you’re producing but aren't sure where to start. Could it be that you're a cheesemonger and are considering jumping from the sales counter to the cheese room? No wait, I know..you’re just tired of whatever you’re doing now and you want to do something real. Something that, just maybe, your family can participate in with you if you'd like. Owning an artisan cheese business is rewarding in every sense of the word! Those of you who've followed me and read my books know I didn't tell my kindergarten teacher I wanted to grow up and be a cheesemaker. Actually, until about a decade ago you could say I was stuck. Stuck behind a desk, stuck on an airplane or stuck on the giving or receiving end of an unending chain of Powerpoint presentations. Sure, the money was good, but the quality of life wasn't and I didn't find meaning in what I was doing. Perhaps some of you can relate. But here was the thing...I knew that if I didn't pry myself out of that career immediately then I'd be stuck for the rest of my life. Doing what someone else wanted me to do instead of doing something I love! That scared the heck out of me! I abruptly pursued a self-sufficient lifestyle that led me to cheesemaking. Of course I had no idea I'd become an award-winning artisan cheesemaker. Heck, I had never even made cheese at home (so don't worry if you haven't either) and certainly had no connections with anyone who would want to buy my cheese if I could figure out how to make it. Of course I did figure out how to make the cheeses that were right for me. I went from having never made a cheese in 2010 to producing 30,000 pounds of cheese in 2015...a huge amount for some folks and a tiny amount for others. But that's the beauty of artisan cheese--you can create a small, profitable lifestyle business or a quite large and very lucrative business. I've run both a farmstead cheese business (where I made cheese from the milk of my own animals) and a purely artisanal cheese business (where I made cheese from milk I purchased from other dairies), so I have a unique perspective into the pros and cons of each business model. 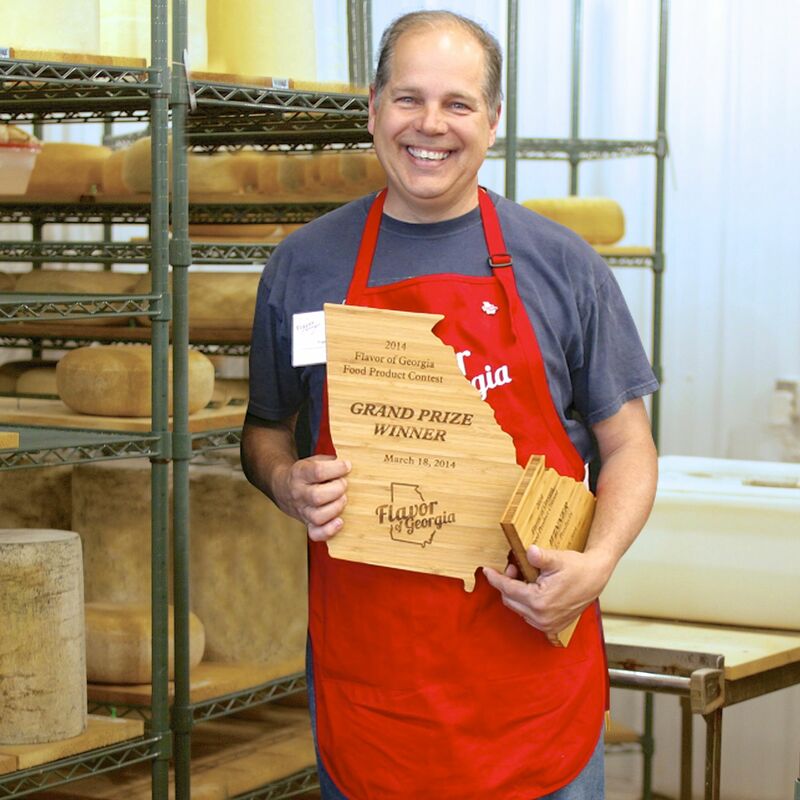 Naturally I was thrilled when my cheeses won a number of awards from the United States Cheese Championship, Good Food Awards, American Cheese Society and even at overseas competitions in the U.K. and South Africa. 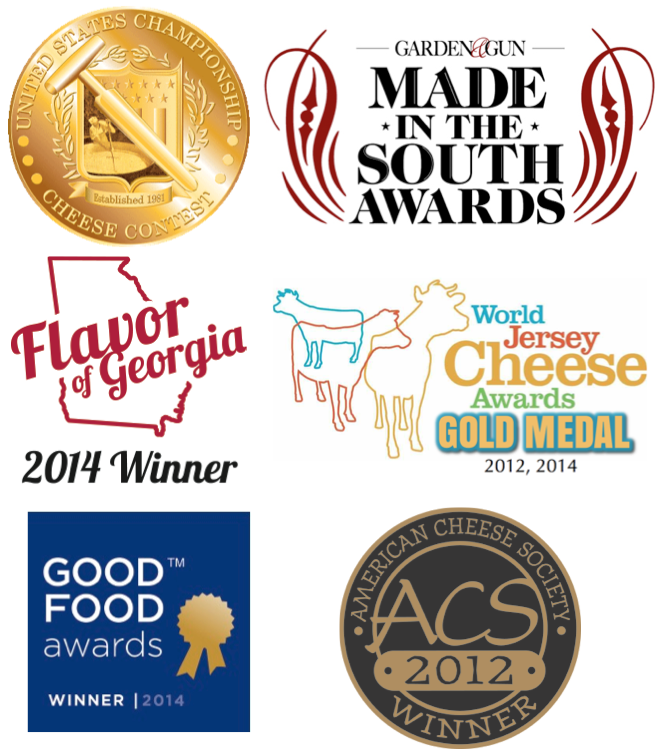 Heck, one of my cheeses was named best food produced in the state of Georgia in 2014 and the same cheese was even named Best Food in the South by Garden & Gun Magazine in 2012! That success was thrilling and selling in person to adoring consumers was very fulfilling, but ultimately I transitioned from selling cheese directly to consumers at farmers markets and CSA deliveries to selling exclusively through distributors so that fine cheese shops, Whole Foods, Murray's/Kroger and top-notch restaurants and resorts could get their hands on it. 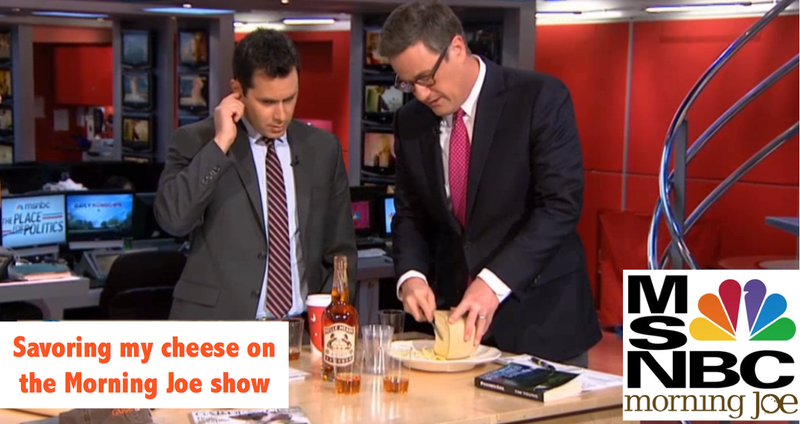 In retrospect, figuring out how to make cheese wasn't so difficult and there are lots of resources available for that. Navigating the do's and dont's of starting and running an artisan cheese business and knowing how to make cheese safely...well, that was a costly lesson, both in terms of time AND money. 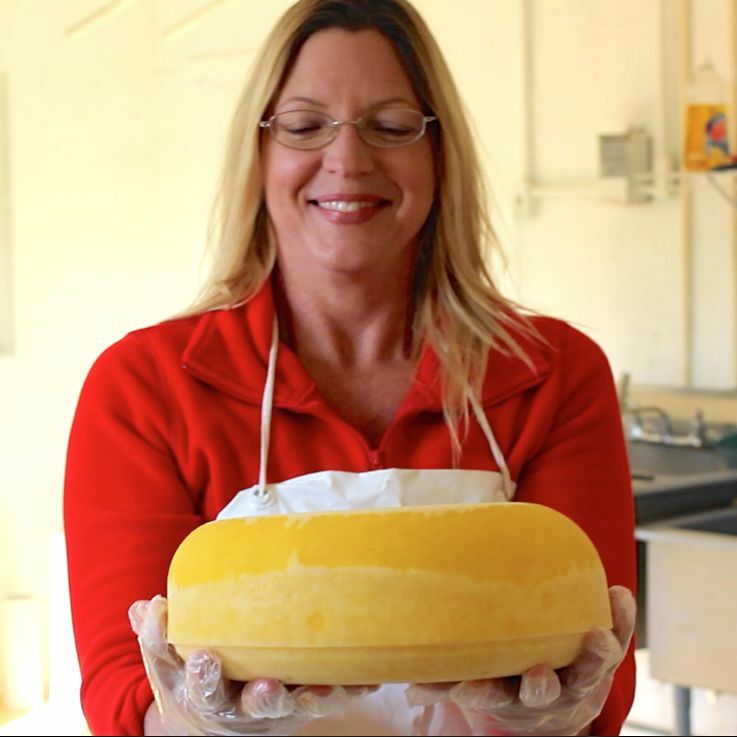 "Artisan cheese is the most rewarding business I've ever been a part of!" I HAD TO LEARN THE HARD WAY...ON THE JOB! Sure, there are books on cheese but they all focus on MAKING cheese and NOT on how to start and run a cheese business. What kind of cheese should I make? Which cheeses are most profitable? How much money will it cost me to start? How much money can I expect to make after I get up and running? And how long before I'll get paid? What kind of space do I need and how do I set it up? What are the regulations? Should I use raw milk or pasteurized, and how will I get and transport milk anyway? How do I get customers? Should I sell at farmers markets or through distributors or what? Where can I find the money to get started? Is there a way I can bootstrap it to save money? Oh, and what if someone gets sick? How can I both prevent that and protect myself? Those questions are daunting, and the answers are hard to come by unless you’re lucky enough to walk in the shadows of an artisan cheesemaker, day in and day out. I wasn't that lucky, so I learned the hard way. And even though I had a lot of success, boy...did I make plenty of expensive mistakes. After receiving hundreds of emails and in-person requests over the past few years, I've finally done it! 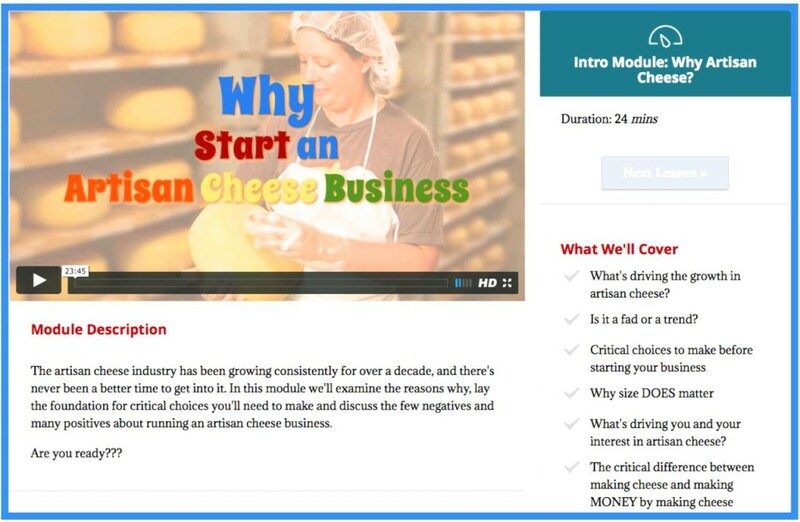 I've created the only online course that leads you through the entire step-by-step process of starting and running a successful artisan cheese business. 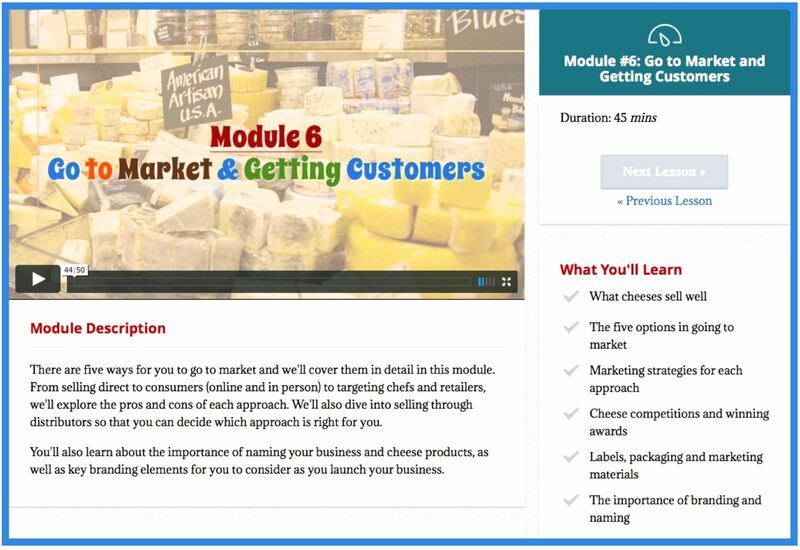 Now, I'm thrilled to share the course because I want YOU to feel the joy of having customers savor your cheese while you earn money doing something you LOVE. 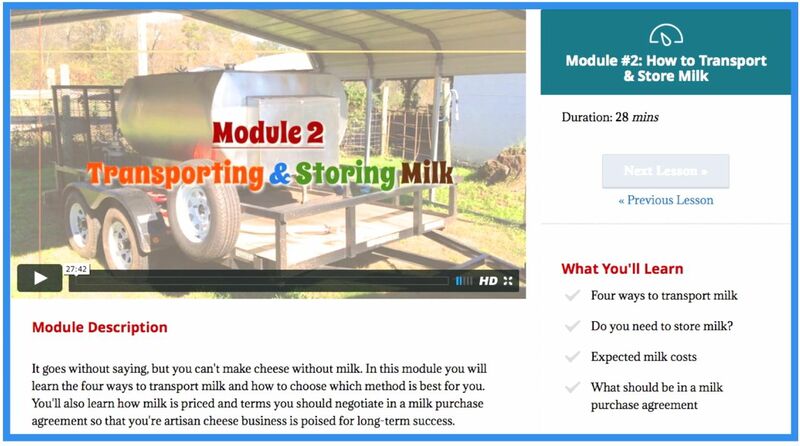 I'll teach you how to buy and transport milk so that you can set up your business anywhere and show you how to save the many thousand of hours and dollars that I spent learning the business. I'll share everything I learned in creating a fulfilling and award-winning artisan cheese business in this step-by-step course! that you can access anytime from any device. Plus, all videos may be instantly downloaded for you to keep on your own device! Bonus # 1 - Cheesy Templates to Get You Started! 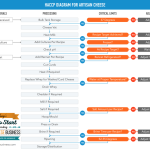 1) A detailed artisan cheese HACCP flowchart! 2) Access to Good Manufacturing Practices & Standard Operating Procedures designed specifically for artisan cheese operations. 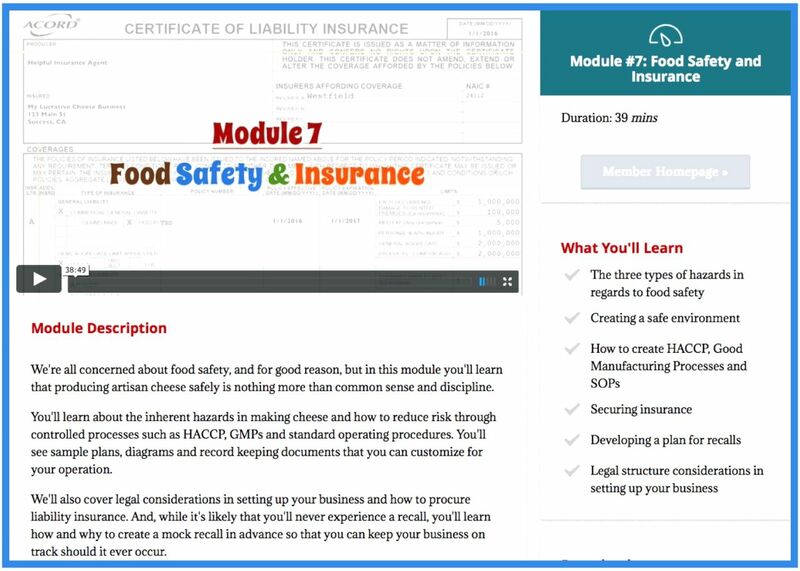 3) A custom-made (just for this course) Artisan Cheese Food Safety Plan in MS Word format for you to customize. 4) Cheese-make record keeping documents. 5) Sample facility layout diagrams to ensure food safety. 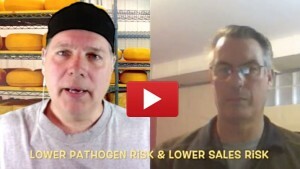 – how to choose which cheese to make for YOUR market. – the importance of packaging. 1) Each course module has a comment section where you can ask questions for me and other participants to answer, offer experience, guidance and encouragement. 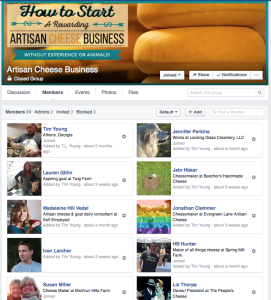 2) Also, join me, industry gurus, artisan cheese business owners and other course students in an exclusive private Facebook group! Post questions, connect with like-minded folks from around the world and learn about the business of artisanal cheesemaking in this one-of-a-kind group! GET THE COURSE FOR $495. There is an incredible amount of proven, step-by-step content here that doesn't exist in any other course. 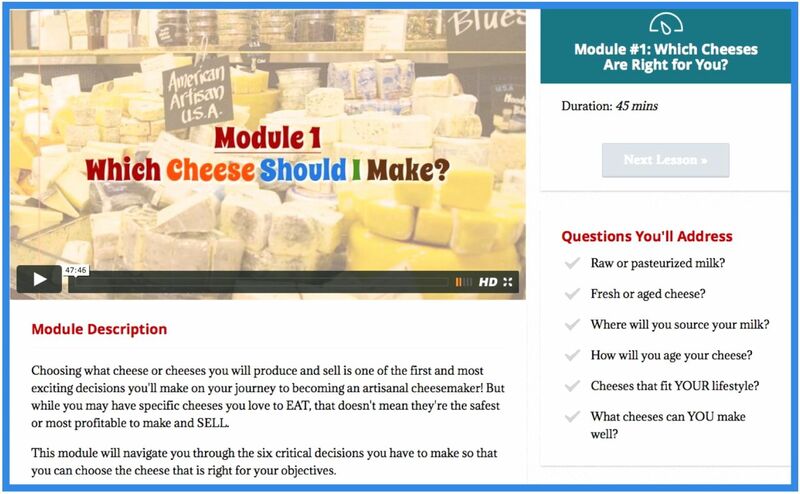 Heck, you can't even get a day with an artisan cheese consultant for less than $1,000 (excluding travel costs), and this course is available to you forever to watch over and over again. You'll even be able to instantly download all videos and materials to your own computer to study off-line, and you'll have access to the updates I'll be making from time to time based on questions from participants and changes in the industry! Now, if you're interested in exploring the world of artisan cheesemaking, jump into the vat with me and let's get started on your journey to a rewarding, lucrative and fulfilling lifestyle. To be sure you're making a wise investment, please watch the video at the top of this page. Not only will it show you how the course is organized and delivered, but it will also show my teaching style so that you can decide if you're comfortable with it...and with me. 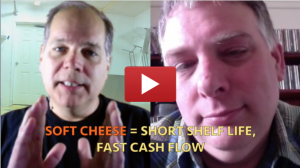 How to Start a Rewarding Artisan Cheese Business is a digital product. After you complete the payment, you will get immediate access to the members-only area with the course content. "I took a cheese class from Tim and he is fantastic! A real inspiration and sharp businessman." "I've learned so much my brain hurts. Definitely excited about making cheese!" "We truly enjoyed your class - we took away so much, were inspired and motivated!" "Tim's perspectives in business planning and marketing were invaluable in the planning of our farm." "This course is for anybody that wants to understand the ins and outs, the nuts and bolts of artisan cheesemaking." "Tim's sage advice, clear experiences and no nonsense advice helped us formulate many of the foundational elements of Synergistic Acres. You can be sure that our farm had a head start thanks to what we learned in a jam packed weekend of learning and sharing!" "We had a great time participating in Tim's class. At the end of the class my wife and I looked at each other and for the first time said 'We can do this'. Now THAT is invaluable!" "It was just plain fun! Our fire is stoked and we are moving forward. If our goal was to make a decision one way or the other, goal accomplished. We will be cheese makers." 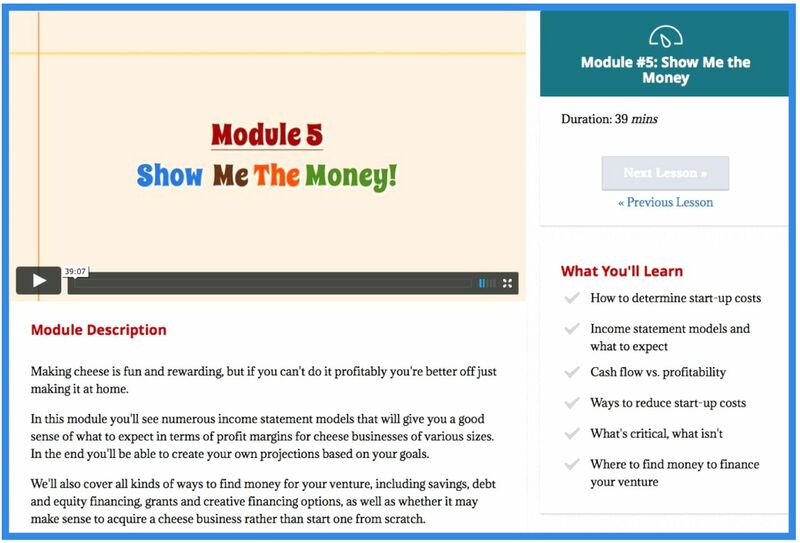 "I found Tim's course to be a wealth of information. It further drove my passion and motivations for what I hope to do, and last year we bought our dream farm!" "I would recommend the course to anybody. You get soup to nuts from milk to the finished product, and it's delivered beautifully by someone who knows what he's doing." "I've taken some other cheese courses, but this is the first one that's truly been applicable to anything that I've wanted to do." "Should I Buy This Course, or Not?" ...wants to explore starting an artisan cheese business. If that's you this may be the best investment you make as you explore the path to artisan cheese as this is the only course on the business of artisan cheese. It covers everything from what cheeses to make, where to find the best deals on equipment, how to set up the cheese plant, how to go to market and get customers, best practices for creating a safe food environment, finding liability insurance, product pricing and much more. In fact, if you are interested in starting an artisanal business of any kind, you'll find this course to be invaluable. ...how to make a specific type of cheese. If you're looking to learn how to make blue, Camembert or any specific style of cheese, this isn't the course. However, I do share a lot of what I've learned about making clothbound cheddars, blue cheese, Gruyere/Alpine style cheeses, as well as making cheeses from cow or sheep milk. And I talk a lot about affinage and which cheeses age well together. There are a few excellent resources "out there" for artisan cheesemakers. Unfortunately, there's not a lot of them, and those that do exist focus more on how to make artisan cheese rather than on how to set-up and run a successful artisan cheese business. If you're interested in a hands-on artisan cheese program, check out the Artisan Cheesemaking Course offered by Sterling College and Jasper Hill Cheese in Vermont. It will set you back $3,000-$5,000 when you factor in travel and lodging, but the instructors really know their stuff. If you want to get more specific, try the Academie Opus Caseus course in France. You'll learn everything you want to know about affinage (aging cheese) from the best in the world. The cost? Just over $3,000...but of course you'll have to make your way to France. 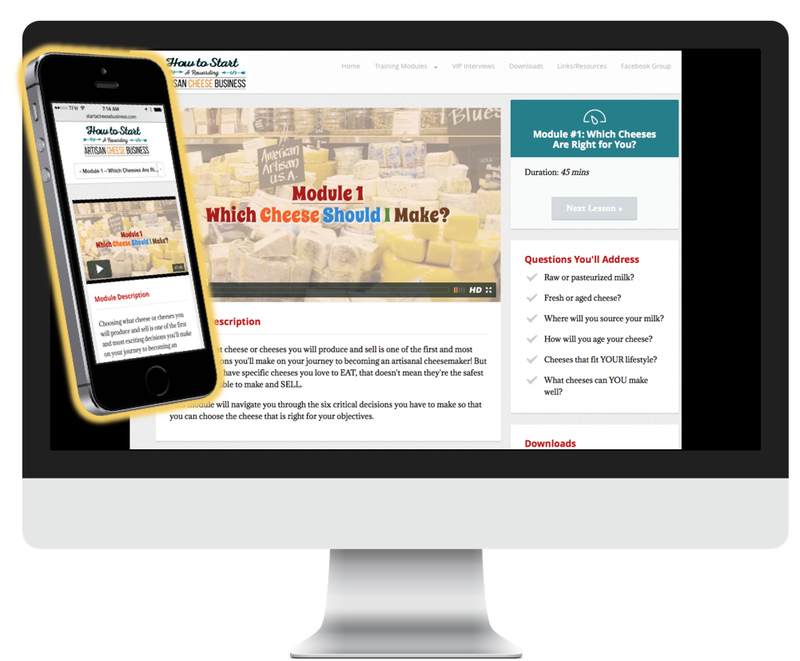 Of course, you can engage a consultant directly, such as the fine folks at CheezSorce to help you set-up your operation. Again, your investment will be many thousands of dollars, but Neville and his team have helped lots of artisan cheesemakers get their start. Live courses and time with consultants are great, but when the course is over the knowledge and enthusiasm often wanes. The value of this online course and community is you can absorb the content over and over again, and it will be there when YOU need it. 1. You'll immediately receive a receipt email for your purchase, and a second email with login instructions. 2.You'll be directed to our Private Members Area to create your login. 3.The Welcome and Orientation video from Tim along with instructions will be staring back at you from the members area. 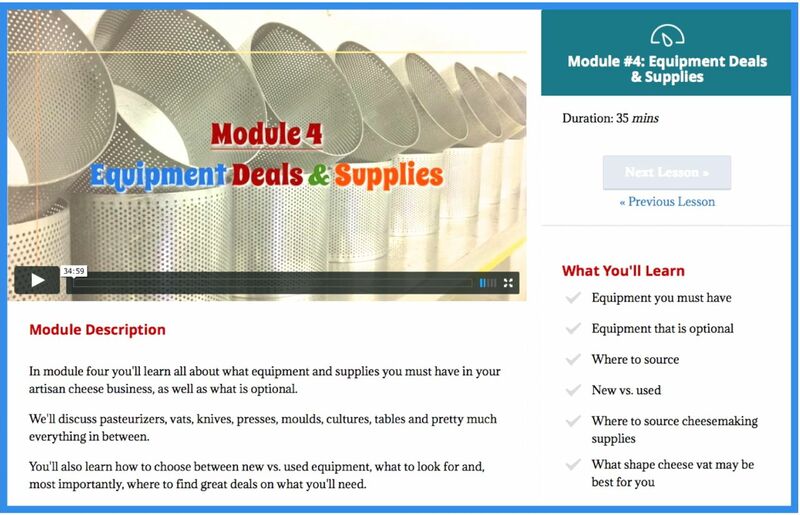 4.You'll have immediate access to each and every module PLUS all of the bonus downloads! 1. Most of the material included in this course is relevant in your country. After all, most cheese making operations around the world employ similar equipment, cultures and sanitation supplies, and the choices regarding species and breeds of milk that this course covers is applicable anywhere. 2. The differences will be in local regulations, but this course doesn't cover all specific regulations in the U.S. either. After all, that's sometimes a state-by-state decision. 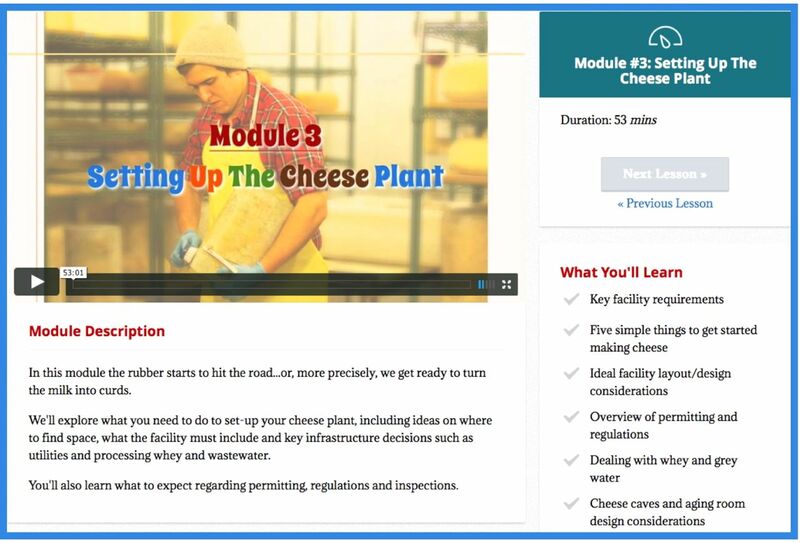 Rather, this course shows you how to set-up and run an artisan cheese business in accordance with YOUR local regulations, wherever you may be. ...you need some type of computer, but that can be anything from a desktop computer to a Mac, smartphone or iPad. Beyond that you'll simply need an Internet connection and the ability to stream video files, but pretty much anyone can do that today. Also, there are bonuses that are in multiple formats, such as .pdf, .doc and so on, so if you want to use them you'll simply need the ability to open them. Again, that's pretty much standard nowadays on any device. Email support@startacheesebusiness.com and we'll be happy to help.